Somewhere there’s a fresh box of crayons missing the color of sunflowers, butter, lemons and bananas. Somewhere, there’s a child who will never be able to draw Curious George and the man in a yellow hat, or the yellow submarine we allegedly all live in. If anyone knows the whereabouts of said crayon box or child, please advise. 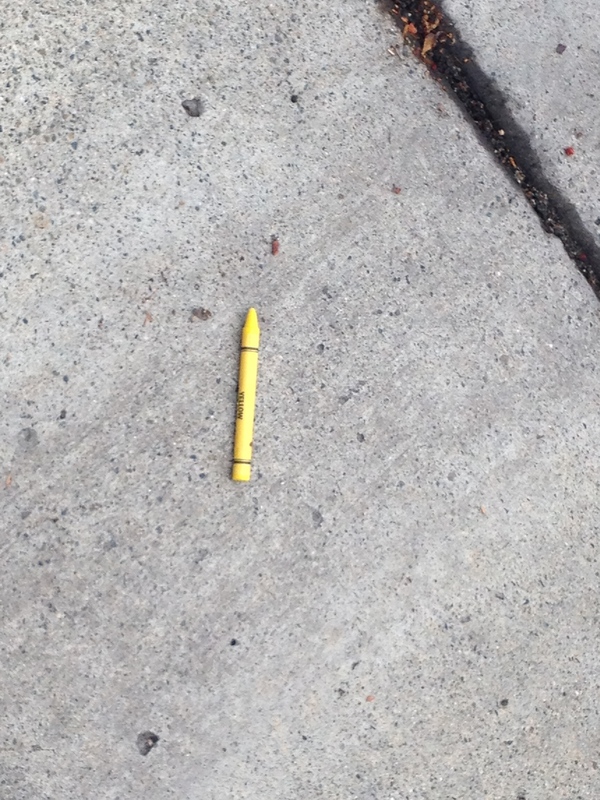 If neither come to claim this sad and lonely crayon, I am committed to finding this little fella a home. So, if anyone is willing to adopt this hapless crayon–which has surely seen better times and hopefully will again–know that I’m taking it to the Home for Wayward Crayons, a local shelter for forgotten crayons and other writing instruments (pens, Sharpies, #2 pencils, feather pens, quills, etc). In the meantime, please keep this little yellow guy in your thoughts and prayers. (Note: I’m taking part in NaBloPoMo. The more civilized name is National Blog Posting Month. Thirty days, 30 posts. I’m not the owner, but if I didn’t live so far away, I would be happy to take her in. We’re always looking for yellow. Is that strange? I don’t know. We draw many things in yellow; sun flowers and strange looking mice. By the way, I love Curious George and the Man in the yellow hat. I hope you find many more treasures on your walks Monica. Waiting to see if yellow finds her home. That’s a fresh crayon you found there. Looks lonely. I don’t reckon it’s worth an ad for the owner to come for but with that Z, they could go for a cool 50 cents. I may be under pricing the value, however. I could put an ad in the Pennysaver, but who knows if the owner would look. Last I heard, Lil Yellow was still in the home, silently waiting for her forever home. Wish her luck! Do you live near an elementary school, Monica? Or do you have lots of neighbors with kids? I’m intrigued by the things you find on your walks (the magnetic Z, this crayon) — both of which, if I remember correctly, are yellow!! And, yes, you remember right! They’re both yellow, something I never noticed. The plot thickens! I’m enjoying the “Things I Find on My Walks” posts. I’m a little worried about that crayon though. It looks so bright and fresh and most of those wayward pens are no good. Me thinks you’re right, Lisa. Those wayward pens are envious of her fresh, youthful ways. Sigh. Where do wayward pens and pencils go? Add single socks to that, too. Will I be seeing you over the weekend? Of course you’ll be seeing me. You’ll be seeing me every single day this month, and then I may go into hibernation for a few days or more. We’ll see. Anyway that’s the goal. Too late. Lil’ Yellow, as she came to be called, was shivering and crying into her yellow paper wrapping. Her future, already predestined. So sad.